Morgan is calm, kind, and warm-hearted. She told us that Ben, the groom, is smart and focused. We have to agree after hearing their engagement story! Morgan was apparently under the impression that Ben was going to wait a few months to propose--her sister (the maid-of-honor-to-be ) was about to leave for a four month trip around the world, after all. Morgan had planned a party to celebrate Ben's 30th birthday, his best man's MBA graduation and her sister's MBA graduation, which all happened to be on the same night. You see this coming, don't you? Friends in town, Family in town, unsuspecting bride. You bet Ben is smart! He surprised her at a private dinner beforehand, proposed, and then they went out to celebrate with all of their friends and family! Morgan told us "it was a perfect night." Enjoy their full wedding film! This loving bunch rejoined together to celebrate Morgan and Ben in Texarkana at the historic victorian family home belonging to Morgan's grandfather. We can tell you this much about this wedding film: We won't forget the tender tears of joy that Morgan shed as she triumphantly held up her hand with her wedding ring after being pronounced husband and wife. The rehearsal dinner took place at The Silvermoon Great Hall on Broad. The authentic mexican buffet was accented with table decor of extremely vivid roses in orange, yellow, mango, and the toasts were just as vivid. Ben's brother joked that although the lessons he's learned from his brother growing up came in the form of a choke-hold, Ben had taught him what it meant to be a good man, and, he was looking forward to Ben and Morgan teaching him what it meant to be a good family in the future. (see minute 5:50 in the video). The toasts went long into the night, joyful, loving, hilarious, and full of honor and respect. We really enjoy being able to add these kinds of moments into a wedding film, because these are the stories of a bride and groom's life--both before and after they met and fell in love, and a wedding is a symbolic representation of all of the work that it took to get to that day. Being able to interweave the stories told by friends and loved ones into a film adds a strong emotional and story-telling element to a wedding video, almost like a time capsule. When we arrived for the day, morgan's dress was hanging in the front bedroom, waiting for her, and the activity outside was cheerful. The beading detail on Morgan's lace wedding dress had ivory magnolias, perfect for a southern bride. 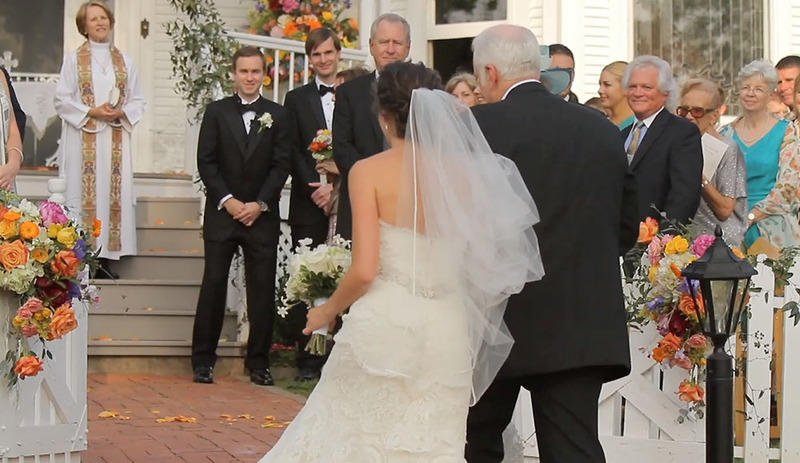 Morgan's entrance to her wedding was epic--she came sweeping around the white picket fence into view of friends and family with her father. The sun was gently glittering through the trees. Morgan also made some stylistic choices with her wedding that we thought were so artistic: Watercolor signs. The rehearsal dinner table decor was a more saturated version of the wedding day colors. The wedding dinner plates were a collection of different china patterns. And at a backyard wedding, all of the other table service was (so elegant) silver. A ruffled white wedding cake with natural, real flowers on top. Morgan and Ben, many thanks for sharing your special day with us and for allowing us to film your rehearsal dinner for your wedding video. It was a pleasure and an honor to meet the fine folk in your family.